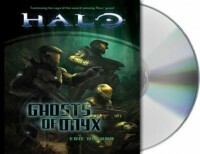 But Halo: Ghosts of Onyx takes place entirely in 2nd gear, trundling along at about 20 mph from disc 1 to disc 9. * "Why," you may ask, "did you continue to listen to this dreck?" A fair question. The answer: My tolerance for audio-visual dreck is far greater than that for prose, and it's not like there's much better on the radio (remember, I'm listening to this on the way to and from work). ** It's a shame that many modern readers of Tolkien find the "slow" parts of LotR interminable. And he's perfectly capable of action: The charge of the Rohirrim at the battle of the Pelennor Field in The Return of the King or the equally tense and gripping scene with the Mouth of Sauron (book version not - repeat NOT - movie version).